A Northern Affair is the story of relationship between a nurse, Esaba, and a medical doctor, Manuel. Esaba and Manuel meet on assignment in the north, where they provide medical services to a remote village. Esaba is initially met with hostility because Manuel realizes that his medical help is a woman, but the relationship eventually transforms into romance. However, each of them harbor dark secrets capable of destroying their relationship. 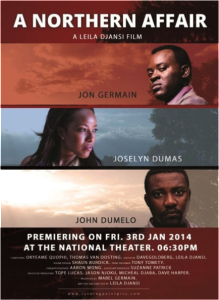 African Video Movies and Global Desires: A Ghanian History by Carmela Garritano. Ohio University Research in International Studies, Africa Series No. 91 (2013), p. 154-194. Twum, Chris. “Ghanaian Movie Awards Need to Grow- Leila Djansi.” The Ghanaian Chronicle. 18 December 2013: Print.